← What is Biodiesel Fuel and How Does it Work? A custom job you can put your waste service vacuum truck on the map. This re-branding can turn the truck into a marketing tool on wheels. The catchy pun stands out, and draws people to it. Branding your truck in this way will help it to be remembered. When you’re driving, you’re marketing – whether you’re stopped at a red light or rumbling down the highway. 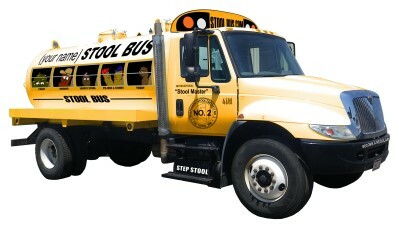 The Stool Bus offers you the chance to participate in the ground-floor launch of a national brand. Allow your trucks to do double duty, with our help. Call us at 303-789-9440 or toll free 866-789-9440 or visit us online: Keevac Waste Service Trucks. This entry was posted in Blogs and tagged Keevac Waste Service Trucks. Bookmark the permalink.